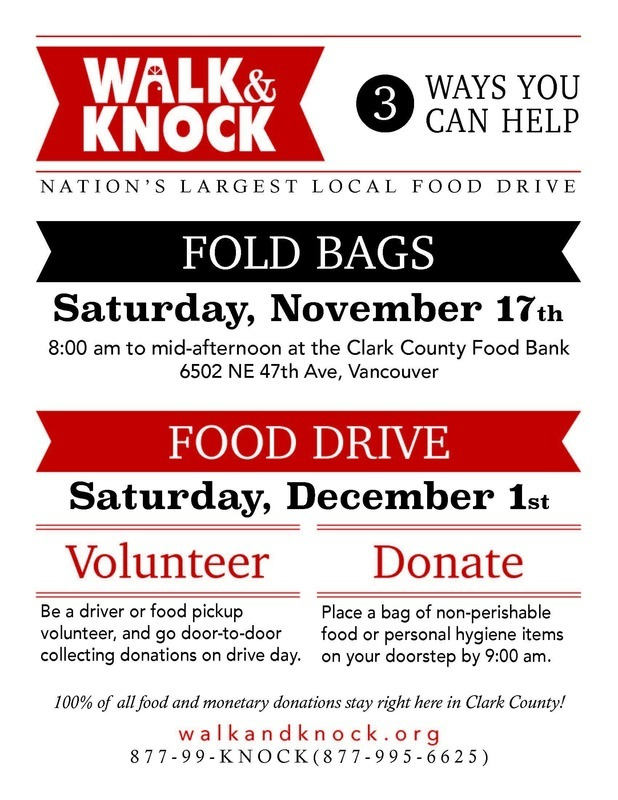 Volunteer to help with Walk & Knock, Clark County’s annual food drive, on Saturday, December 1st. All it takes is a half-day of your time but can make a huge difference for many. Walk & Knock is one of the nation’s largest one-day food drives and takes place each year on the first Saturday of December in Clark County. It solicits charitable donations of food for the Clark County Food Bank to help those in need across our community. Last year, over nine tons of food were donated. However, to make this happen, volunteers are needed to collect food donations door-to-door in Ridgefield. The Ridgefield Lions Club has been a major facilitator for this important community food drive. If you’d like to help, please sign up as either a driver or walker by clicking here. All volunteers will meet at the Sunset Ridge Intermediate School/View Ridge Middle School campus at 3215 S. Hillhurst Road, on Saturday, December 1st at 8:30 am. Volunteers are needed from 8:30 am to 12:30 pm. Volunteer drivers follow a specified route, assisted by walkers to pick up donations and then return to Sunset Ridge/View Ridge Middle School to unload donations. Volunteer walkers go door-to-door to collect food, placing them in the vehicles. It is ideal to have two walkers per car for the collection of food. If you are not available to volunteer on December 1, see the flyer below for other ways you can help. All volunteers are greatly appreciated! For more information about the Walk & Knock food drive, visit http://walkandknock.org or call 877-995-6625.